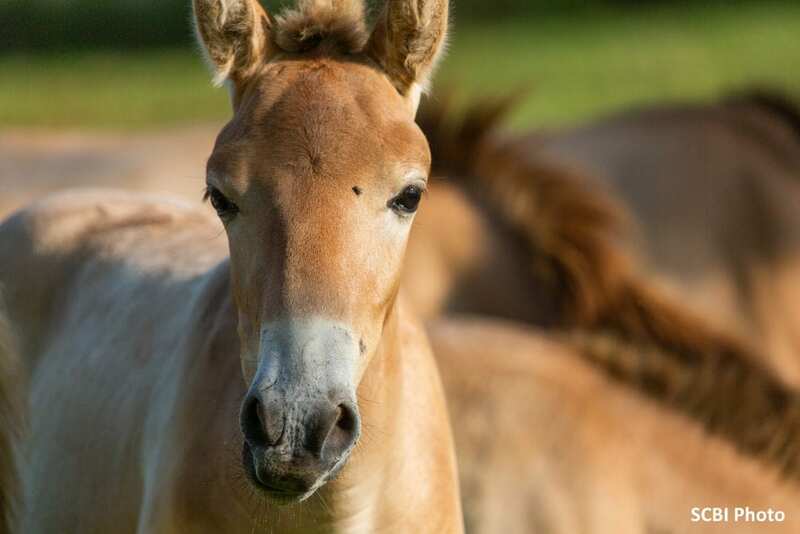 Four endangered Przewalski's (sha-VAL-ski) horse foals were born at the Smithsonian Conservation Biology Institute (SCBI) between March and June. The first foal, a filly named Dahlores, was born March 20. The younger three foals are colts and were born March 23, April 30 and May 29. It is the first time in 28 years that SCBI has had that many foals at one time. The foals are thriving and are living in a herd with their mothers. Native to Mongolia, China and Kazakhstan, Przewalski's horses are listed as “endangered” by the International Union for Conservation of Nature. They were once extinct in the wild, and all the Przewalski's horses alive today are descended from 14 individuals. SCBI scientists study Przewalski's horse reproductive biology and have developed assisted reproduction techniques to help build a self-sustaining and genetically diverse population in human care. In 2013, the first Przewalski's horse born as the result of an artificial insemination was born there. SCBI ecologists also study Przewalski's horses in the wild. They are learning about the movement and behavior of horses reintroduced Hustai National Park in Mongolia by tracking them with GPS tags. This year, 35 foals were born in the park and 28 survived through their first critical months. The survival of many of the foals proves that the horses reintroduced to the wild are thriving. A healthy population capable of producing foals will be necessary to establish herds of free-ranging Przewalski's horses in the wild. Przewalski's horses have long been considered the last surviving wild horse species, but a recent study has raised speculations. The new data highlights a close genetic relationship between Przewalski's horses and Botai horses. Botai horses are considered by some scientists to be the first domesticated species of horse. However, Botai horses form a clade (a group of descendants from one common ancestor) distinct from domestic horses. There is no strong evidence that Przewalski's horses are feral descendants of domestic ancestors. Rather, they are unique descendants of horses within Botai/Borly clade and represent genetic diversity that is no longer found among horses. They are integral to a healthy steppe ecosystem. SCBI plays a leading role in the Smithsonian's global efforts to save wildlife species from extinction and train future generations of conservationists. SCBI spearheads research programs at its headquarters in Front Royal, Virginia, the Smithsonian's National Zoo in Washington, D.C., and at field research stations and training sites worldwide. SCBI scientists tackle some of today's most complex conservation challenges by applying and sharing what they learn about animal behavior and reproduction, ecology, genetics, migration and conservation sustainability. This entry was posted in Horse Care, NL List and tagged endangered species list, extinct, foal, foals, mongolia, mylittlephrose, Przewalski, przewalski's horse, smithsonian conservation biology institute by Press Release. Bookmark the permalink.